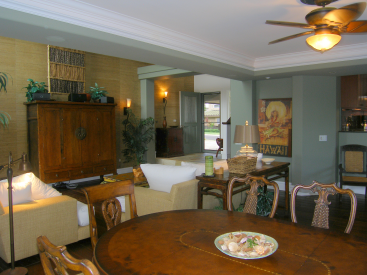 Enjoy many custom upgrades and furnishings in this truly exceptional and magnificent luxury two bedroom 2.5 bath townhome in the exclusive community of Ka’iulani of Princeville. This home is stunning in every way and is a “must-see” to fully appreciate all the upgrades and furnishings that set it apart from the others. Comprising 1,892 square feet with an attached 2-car garage, this Hawaiian decorated home offers custom paint and grass wallpaper, flagstone flooring in the entry, kitchen and downstairs bath, Santos Mahogany wood flooring throughout, plantation shutters, upgraded fans and surround sound in the living room area. No expense was spared on the upgrades or furnishings. 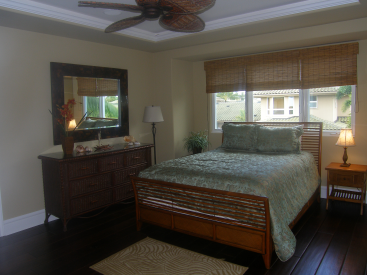 The floor plan is arranged with the two bedrooms located at opposite ends of the second floor with the master suite providing valley and mountain views, as well as, partial ocean views. The main floor accommodates the entry, large living/dining area, kitchen and the powder room with custom faux textured walls. 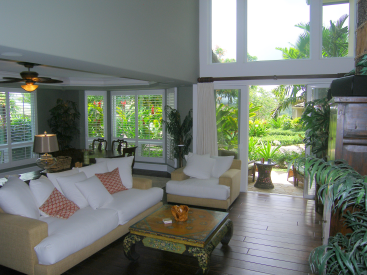 Soaring 18 foot ceiling in the main living area add to the spacious feeling of this home. This spectacular townhome is a fabulous home to own. The kitchen area offers a Sub-Zero stainless steel refrigerator, a Wolf stainless steel oven, a Wolf gas cook top and double Fisher Paykell dishwashers. 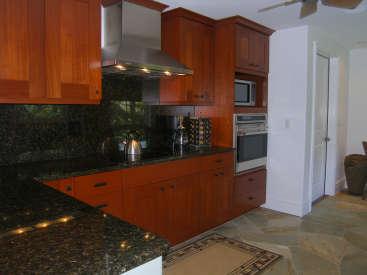 Black granite counter tops are in the kitchen and baths, along with, Aristocratic mahogany cabinets with custom pull knobs. 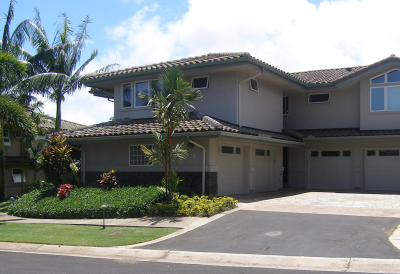 Ka’iulani Of Princeville is the latest edition of luxury condominiums to the Princeville community. 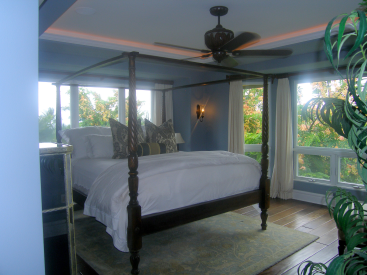 Located on Queen Emma’s Bluff, this development contains only 77 units. The amenities at Ka’iulani of Princeville are the very best Princeville has to offers with three heated pools, a spa, two BBQ/entertainment areas, a full-time on-site resident manager, lighted walking pathways and numerous water features throughout; making Ka’iulani of Princeville the “premier” community of Kauai’s North Shore.